First you need to decide which drivers you intend to use. Drivers are the parts that actually move the air; that is, larger-size woofers for the bass, mid-size drivers for the midrange, and tweeters for the high frequencies. These three parts are the gateway to building a three-way speaker system. To build a two-way system you need only a tweeter and a mid-bass unit, which range from 4” to 8”. Except for one horn-loaded system, this guide will restrict discussion to closed box and vented systems, which are the most accessible and straightforward for beginners. Eventually, readers may wish to continue beyond the basics to explore passive radiators, electrostatic speakers, transmission lines, or more complex horn-loaded systems. Each driver has its own special characteristics, most quantified by numbers described in its parameters. Other characteristics, such as frequency response and impedance, are typically shown graphically. For most drivers these days, you can find these important numbers and graphs on a manufacturer’s specification (spec) sheet. However, many builders prefer to measure them directly, which is often more accurate. Placing these numbers into equations or entering them into special computer programs will provide the reliable answers needed in the design process. The two main ingredients needed in speaker design are finding the correct volume of the cabinet enclosure and finding which electrical parts are needed to build the crossover. A crossover is an electric device that uses resistors, capacitors, and inductors to filter out certain frequencies going to the drivers. For example, a properly designed crossover makes certain that low frequencies don’t reach the tweeter in sufficient amounts to either cause harm or unpleasant sound effects. At the same time, the crossover allows high frequencies to go to the tweeter. The crossover won’t only protect each driver but, if well chosen, will allow exactly the correct band of frequencies to arrive in the proper proportion to each driver of the speaker system. work, even if only to assemble the parts of a kit. However, most projects have fairly involved woodworking and wiring, including the use of miter joints, routing recessed holes for the drivers, and the soldering of a complicated crossover. Once you have decided on your budget, you will be looking for drivers that can work together to give you the smoothest integrated frequency response. What follows is the information you need to make an intelligent choice. Above: Fig. 1: The complete speaker system: drivers, crossover, and box. Although not necessarily mutually exclusive, it often is the case that a driver is optimized specifically for one objective or the other. While most readers will find this guide more geared toward the audiophile, nonetheless at several junctions pro-sound applications will be mentioned. Whatever your situation, an under standing of the parts that make up a driver and the numbers that determine driver behavior are paramount. Paving the way for this understanding are some basic notions embedded in the history of the development of electricity and physics. Technology keeps improving drivers so that the most recent are often the best. Above: Fig. 2: A cut-away section of a moving-coil driver showing the various parts. Above: Fig. 3: “Break-up” modes in a driver cone. This blurb gives less information than it seems. The only thing you could be sure about is the diameter of the driver. Saying this woofer operates from 34Hz - 5,000Hz (Hz is short for hertz, the frequency in cycles per second) gives you no idea of the SPL (sound pressure level measured in dB or decibels) at which the driver functions when a certain number of watts of power is input. It may well produce a sound at 34Hz, but perhaps at a level so low you cannot hear it. Likewise, although the range is claimed to go up to the relatively high frequency of 5kHz (the “k” represents kilo, or 1000), can you actually hear it? What about the band of frequencies in between? The response might be very ragged, with numerous drops and high peak resonances. Likewise, specifying 8 is only a nominal value, and as has been mentioned, drivers (with the possible exception of ribbon designs) don’t behave like resistors at all. The word impedance is used rather than resistance to describe the complex nature of resistance in a driver (resistance and impedance are both measured in ohms). The impedance of a driver changes as the signal frequency changes, which is why the graph of a driver’s impedance will be a curve rather than a straight line. Even the mention of a 12” woofer does not mean it’s capable of driving sign it amounts of air without distortion. Quite possibly the cone may have a very restricted motion or a minuscule magnet on the back more suited for use in a tweeter. A spec-sheet, with a description of features, frequency response, and impedance graphs, would be of immensely more help in making a decision than the info in the for sale ad. In Fig. 2 you see the essential parts that make up a speaker driver. Many of these parts have a direct bearing on the quality of sound the driver con tributes in a speaker system. Let us ex amine some of the parts referred to in the figure. • A—the Cone. The part that actually moves the air. 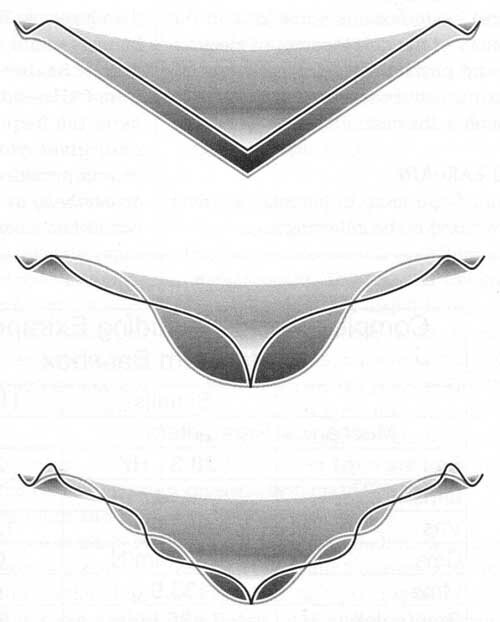 Technology has continually improved cone materials, al ways striving to attain a better ratio of extremely light material to very rigid fabric. The attempt is to find a textile composition that will permit the driver motor to move the cone quickly and efficiently yet control cone “break-up” modes that can cause nasty resonance peaks. Figure 3 shows how a cone can flex as frequency increases - . - At first, paper was the universal material used, but now bextrene, polypropylene, pearl mica-injected polymers, woven fiber glass, woven carbon fiber, metal alloys, aerogel Kevlar thin ceramic material, and even banana fiber are used in woofers and midranges. Above: Fig. 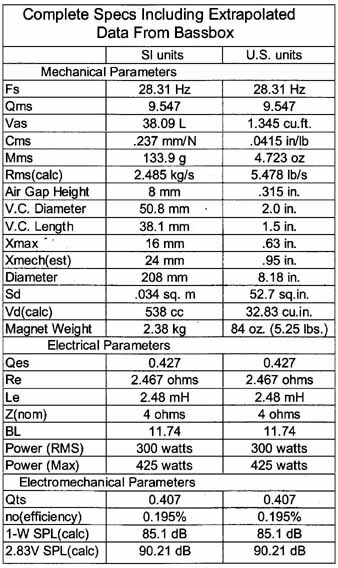 4: The spec sheet for a Titanic 1 OMKII woofer. Some manufacturers are returning to paper, but using special types either treated or reinforced with synthetics such as Kevlar. 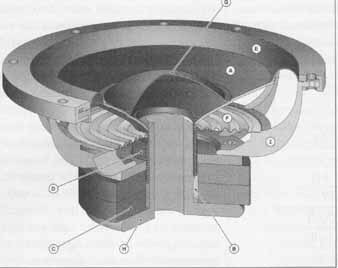 Dome tweeters will sometimes use aluminum, titanium, silk, or other treated fabric to repro duce the high-frequency domain. As you might suspect, each of these materials has its own advantages and disadvantages. For example, metal alloys often sound exceptional over a certain range but can have an exaggerated response at high frequencies, something a designer should take into account by appropriate filtering in the crossover design. Size often matters. For example, cone diameters have an effect on high- frequency reproduction. Although large cone areas can move more air at lower frequencies, these same large areas meet with increasing air resistance when attempting to replicate higher frequencies. Small area diaphragms such as those found in tweeters are far better at both reproducing the high-frequency range and providing broad dispersion. For similar reasons, medium-size cones are used for the midrange of sound reproduction. Much of the search for better cone materials attempts to achieve excellent transient response from a speaker driver. Good transient response is the capacity of a driver to accurately repro duce the sharp staccato attack of musical notes that come and quickly go without continuing to “rin like a bell after the note is gone. If a driver cannot control itself from continuing to sound the long-departed spent note, notice able muddiness occurs. • B—the Gap. This is the critical opening between the front plate and the pole piece The pole piece is made of iron pieces which become the north and south pole for the surrounding cylindrical magnet. In this gap a powerful permanent magnetic field is concentrated, poised to interact with any electromagnetic field produced by an alternating current sent through the voice coil. Once the two fields interact to produce a force on the wire in the direction governed by the right-hand rule of vector geometry, the voice coil (and attached cone) will be set into a motion perpendicular to the permanent magnetic field. • C—the Magnet. Typically made of a ferrous ceramic material—(strontium iron) or sometimes alnico (aluminum nickel-cobalt)—the size and weight of the magnet has a direct bearing on the strength of the motor system. Sometimes a manufacturer will make use of a double (as seen in Fig or triple magnet system to increase the strength of the magnetic field. Three of these driver types are used in the speaker systems of Chapter 1.1. In the small space allotted for tweet er magnets, manufacturers will resort to expensive rare earth materials such as neodymium-iron-boron to maximize the magnetic field. Rare earth magnets can produce a magnetic strength as much as 35 times greater than ceramic ferrous types. The maximum energy product of a magnet, in cgs units, is a combination of its residual induction strength in gauss and its coercive force in oersteds. • D—the Voice Coil. The voice coil is made of insulated wire, through which the signal will flow, wrapped around a cylinder called the former. This cylinder is critically aligned and inserted into the driver’s gap. Along with the magnet, this forms the basis for the driver’s motor. The strength of the voice coil comes essentially from the length of wire wrapped around the former. The geometrical position of the voice coil in the gap determines how far the cone can safely move in and out of the gap, designated as Xmax (usually given in millimeters, mm). This amount can be as much as 16mm in long throw woofers and this, along with a sizable voice-coil diameter for dissipating heat, gives some indication of how resilient a driver will be when driven hard. Some times a former, using a material such as Kapton is coated to aid in dispersing heat build-up. • C—D——the Driver Motor. When the voice-coil wire length (1) is multiplied by the magnetic field density (B), the Bl product gives an idea of the force that can be exerted on the cone in Tesla meters per newton. When the Bl product is multiplied by the amount of current (i) flowing in the voice coil, the exact force can be calculated. In general, the greater the Bl product and the lighter the cone in combination with an appropriate suspension system, the more efficient the speaker will be at producing sound. In the 1950s, when many drivers were inefficient and low-powered tube amplifiers abounded, horn- loaded speaker systems were the rage for producing hefty sound pres sure levels. As in Edison’s early phonograph, a horn can transform a driver’s high sound pressure output by gradually channeling it through a controlled air column so as to more efficiently match the driver’s high acoustic impedance to the air’s low acoustic impedance. With today’s improved driver motors and amplifiers, horns are not a necessity. But successful home system horn designs are made to this day. Horn-loaded systems are often seen in PA systems and found in large spaces such as auditoriums and clubs. • E—the Surround. The part of the driver’s suspension system in which the cone terminates. It’s usually made of rubber or foam. Many older commercial drivers used foam material in the surround which has crumbled over the years. “Re-coning kits” are now available to correct this failure. Fortunately some modern foam contains an anti-UV agent to reduce deterioration. Since cone vibrations terminate at the surround, if it can quickly clamp these and thus reduce ringing, it pro vides a welcome improvement. Some surround materials such as Norsorexm, if made into a ball and dropped, has very little bounce. Such materials have excellent self-damping characteristics. • F—the Spider. Attached to but hid den behind the cone is a wavy ridged piece of material (often linen) that resembles ripples frozen in a pond. Its primary function is to pro vide a critical restoration force to the pushing and puffing of the cone. It greatly affects the resonant frequency of the driver, as do the cone and voice-coil mass. Those planning to play speakers at high SPLs or in tending to build speaker systems for DJ or club work might look for a feature known as a “progressive spider” in the suspension system. This spider type adds an important characteristic to drivers; as a voice coil travels beyond its Xmax range, this suspension system puts a progressively stronger brake on the motion of the cone. • G—the Dust Cap. The material of this dome is designed to prevent small particles such as dust from entering the gap. However, if the cap is made of solid material, air compressions and rarefactions will form in the gap area. But if the cap material leaks air, then making an airtight cabinet can prove difficult. By re-thinking the design of the back plate, engineers have found one way to resolve this challenge. • H—the Back Plate. This piece is sometimes vented through a hole in the rear. This hole helps relieve the air pressure caused by a solid dust cap and releases any heat build-up in the gap. • I—the Frame. Integrates and holds the suspension system, cone, and the driver motor together. As you might suspect, rapid and vigorous motion of the cone transfers vibrations to the frame. Many speaker drivers use a simple stamped steel frame. Strong as this is, more expensive units often use a more massive magnesium or aluminum cast frame, producing a supporting skeleton more immune to pulsating cone effects. 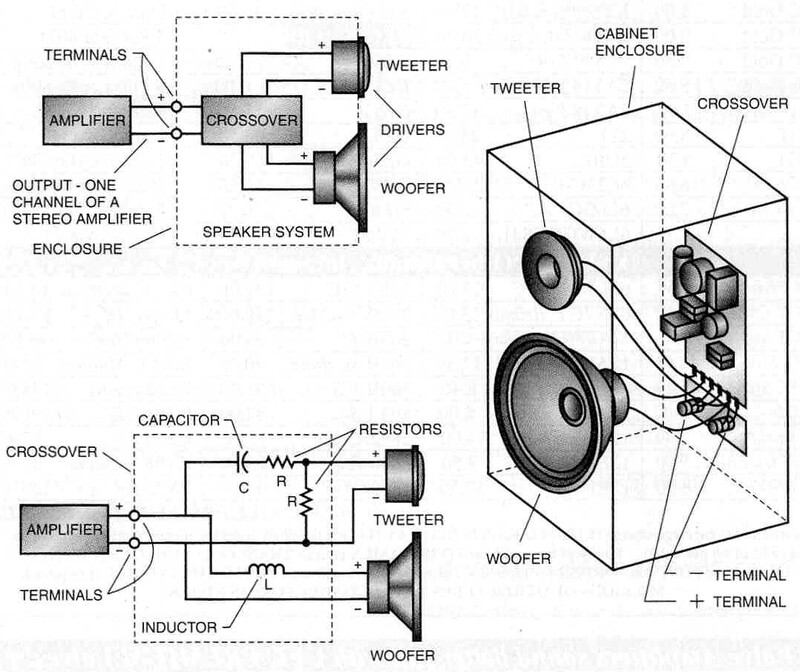 Figure 4 shows the specification sheet for a Titanic MKH 10” woofer, used in Chapter 11 in one of the designed systems. If you are new to speaker building, this myriad of letters and sub scripts must seem a muddle. What is important? What do they mean? How do I use them? These parameters are important, and many must be used in order to find out what box size is needed or even what type of box to use. They are called Thiele/Small parameters, named after Neville Thiele and Richard Small, two engineers whose technical papers explained the alignments and calculations needed to find the size of closed and vented speaker cabinets. 1, Abraham Cohen, Hi-Fi Loudspeakers and Enclosures, Hayden Books, 1968.